This month’s student led display at New College Library features the facsimile Codex Purpureus Petropolitanus, which is on display at the entrance to New College Library. This Codex is one of the three manuscripts to be discussed in the next Biblical Studies seminar “Window to a Sixth-Century Scriptorium: Three Luxury Gospel Manuscripts and the Scribes Who Made Them” on Friday 10 March. Codex Purpureus Petropolitanus (N 022) [facsimile] Four Gospels; Sixth century (Possibly Syria?). Codex Purpureus Petropolitanus (N) is a sixth-century luxury manuscript of the Gospels. It is one of only a handful of “purple codices”—manuscripts written with inks made from melted silver and gold on parchment that had been dyed purple. The purple colour indicated the luxury status of the manuscript, making it fit for the use of the Emperor, perhaps even the emperor Justinian. In this particular manuscript, the scribe usually writes with silver, but he or she writes references to God or Jesus in gold to set them apart from the rest of the text. See, for example, the four letters in gold, 4 lines from the bottom of the first column on the right page. These four letters are abbreviations for the words “God” and “Son” in the text: αληθως θ(εο)υ υ(ιο)ς ει (“Truly, you are the Son of God”). The facsimile is open to Matthew 14:26–36. 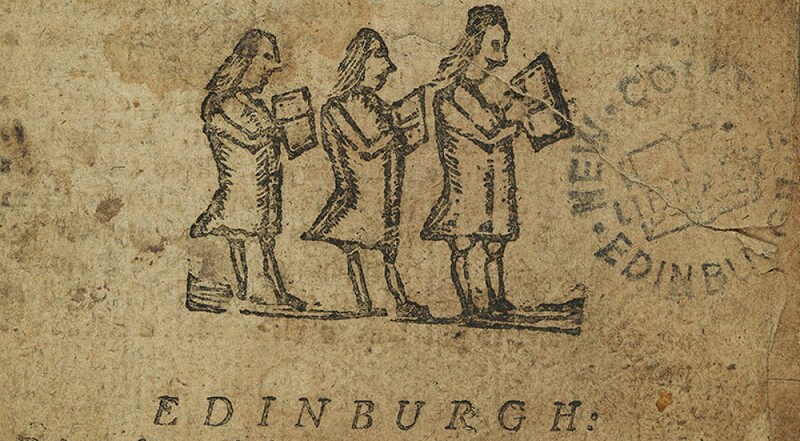 This opening is an excellent example of how much the conditions in which a book is kept can affect its appearance. These two folios remained together for around 1,300 years. They were numbered consecutively, relatively recently in their history (see the numbers 82 and 83 written in the centre of the top margins). At some point after they were numbered (probably around the year 1896, but not before 1820), the folio on the left was separated from the rest of the codex. 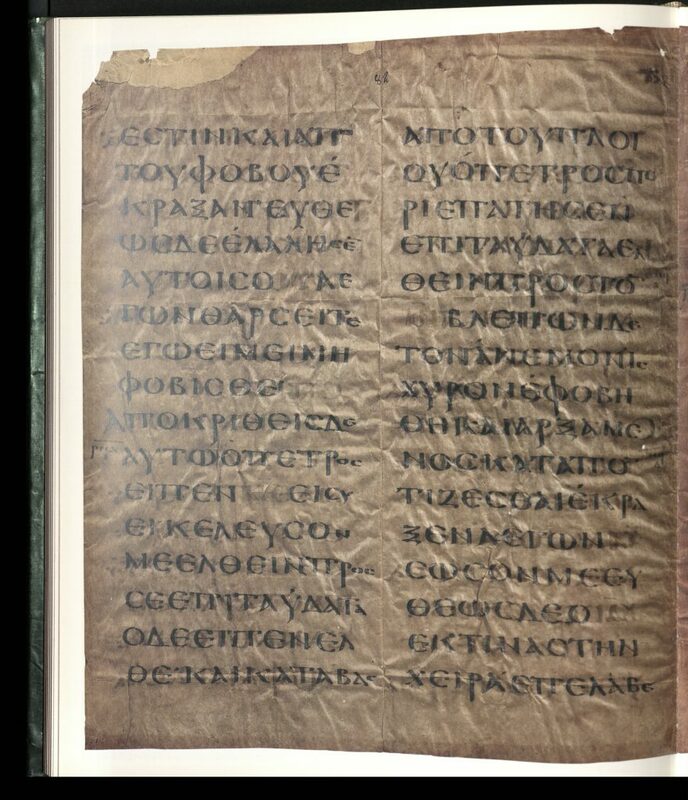 When the folio resurfaced in Athens in the 1950s, its purple dye had faded, its silver ink had tarnished, and the folio had crease marks because it had been folded up. The folio on the right remained protected within the majority of the codex, and only the silver letters around the edges of the page were exposed to air and tarnished. which was sold to Russia in 1896, and it remains in St. Petersburg to this day. 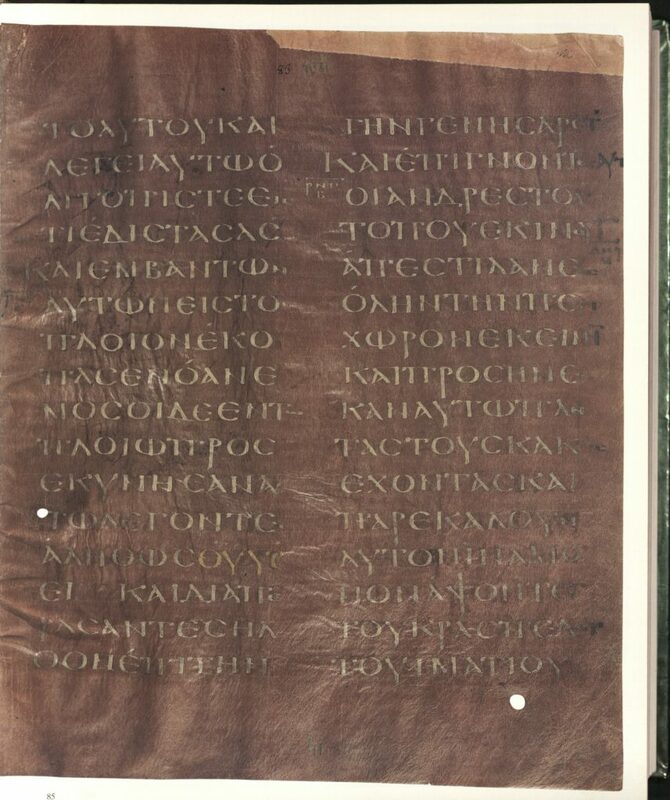 Codex Purpureus Petropolitanus is cited as N in most modern critical editions of the Greek New Testament. Its text is an early form of the Byzantine textform found in the majority of Greek New Testament manuscripts. Most scholars think it was made in Syria (possibly Antioch). This entry was posted in Library, New College Library and tagged Bible, Biblical Studies, Greek, new college library, students by cloverodgers. Bookmark the permalink.